Developed by Glu Games - so you know it is good - Dino Hunters: Deadly Shores is a straight-forward hunting game with a twist - instead of hunting for elk or deer, we are hunting dinosaurs! 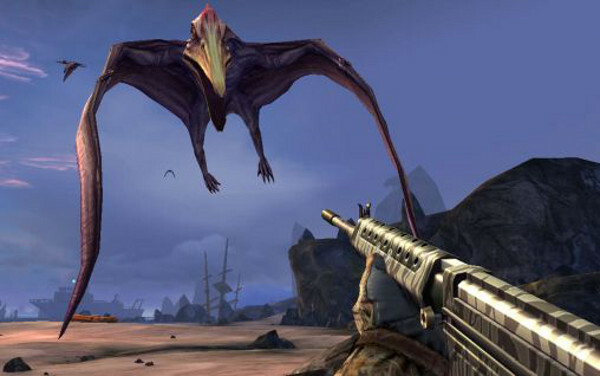 The Dino Hunter series uses the same basic interface as the Deer Hunter series - so if you have already mastered that, you have a decided advantage coming into this game. Though really hunting dinos is a lot more fun than hunting deer - just saying. The energy bar is a fairly common element in free-to-download, free-to-play games: the way that it works is simple enough - it rewards good play and punishes bad play. In Dino Hunter the Energy Bar gets a single charge deducted for each regular hunt, and 2 charges for trophy hunts. The Energy charges are refilled automatically when you do well - but drain when you don't. The solution to that is to either wait out the timer for it to recharge before you can play, or pay to recharge it with Gold (one of the premium currencies). Leveling up will charge the meter too. All hunts are not created equal - in fact many of them have special requirements - from killing the correct dinos to shooting them in the designated spots - and the big score and best rewards are obtained by doing precisely what the Huntmaster orders. That being so, when you start a hunt be sure to pay attention to what you are being asked to do - and then be sure that you do it! 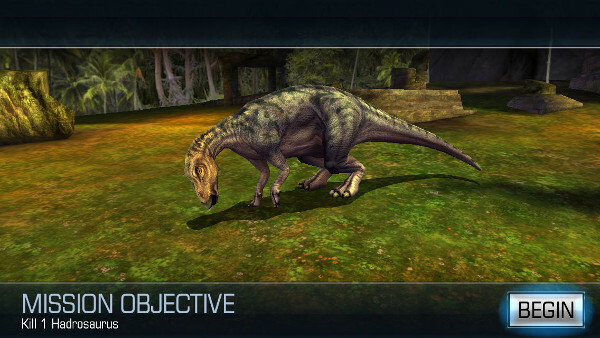 Remember that you Another factor to bear in mind is that in addition to obtaining the best score for the hunt, you also get paid extra for the completed objectives - for example shots in vital organs pay a bonus - as does bagging a rare dino! 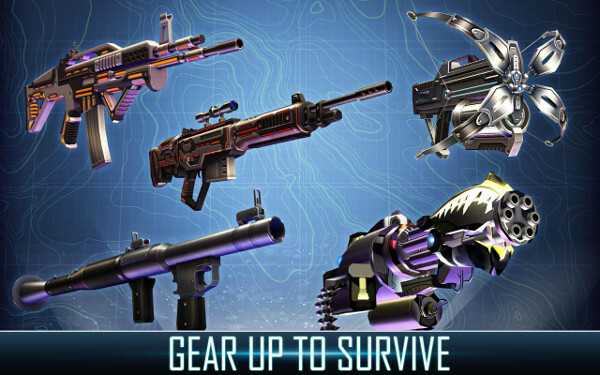 Every weapon in the game has stats for Power, Stability, Max Zoom, Infrared, Capacity, Reload Time, Fire Rate and Suppression. Upgrading specific stats is often a requirement for the advanced hunts - but when you have the money you are not restricted to just the required upgrades - you can surpass them. Something to bear in mind as you hunt. Bear in mind that the early upgrades are instant but the advanced upgrades can have timer delays on them. 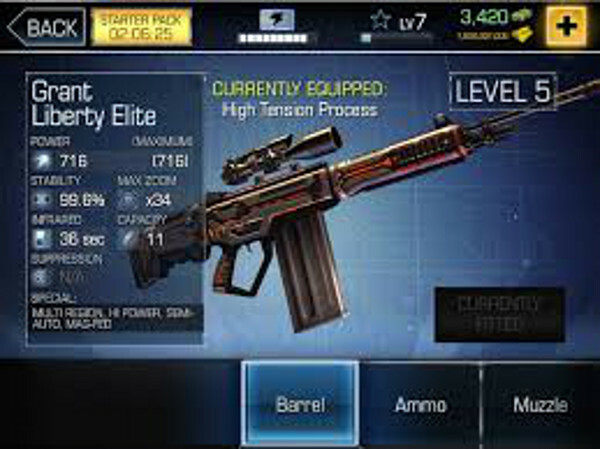 As you progress through the game the hunts get harder and have more requirements than early on - the problem being that if you don't possess the type of weapon required, your weapon power fails to meet the requirements, or one of the other settings is not advanced enough, to continue the hunt requires you to IPA the money required for the upgrades. Or does it? When you lack the funds to obtain the upgrades required for the advanced missions you don't actually have to spend real-world money - instead you can keep doing the Contract Hunts until you obtain the money to buy the upgrades you need. For a lot of the hunts you go on there will be more than the type of Dino you were sent after present - and the sound of your shots as you try to bag the targets can (often will) attract other dangerous beasts! Learn to switch between your long range scoped weapon and your shorter range backup weapon so that when (not if) a predator attacks in the middle of a hunt you can bring the more appropriate weapon online and dispatch that threat. The Gold Bars are the Premium Currency in the game - and are the sort that you are expected to pay for if you will be choosing a Premium Weapon. Or maybe not. The game rewards you with Gold each time you level up - and while you may very well reach a point where you run out of Energy and are tempted to use some of that free Gold to recharge, resist that urge! You are far better off saving that Gold until you have the purchase price of one of the special, premium weapons and buying that. The key to advancing in the game is to collect the Map Fragments that are required to assemble the map for the next region. To do that you need to find all pieces in the main series hunts, as well in the boss hunt at the end of a level. You will not find them in the Contract Hunts, Exotic Series or any of the other hunts - something you should bear in mind. When you examine the new region you will be able to see which pieces you have already obtained and which you still need to obtain. If you are having trouble figuring out what you needed to do to get the missing pieces, go to the next region display and tap the “i” on the corner of the missing pieces - that is the Information button and it will reveal a clue about how you can obtain that missing piece. While each hunt can have specific requirements that often include a heart or lung shot, there is something you should know about those two target spots: they are worth hitting for more than just the bonus money you earn in the doing of it. In addition to paying that bonus money, hitting the heart or lungs does bonus damage to the target - and when the target is a boss mob, and extra damage you can pull off is well worth the effort! The Boss Hunts can be the most frustrating of all of the hunts mostly due to the fact that the boss mobs tend to be the strongest, fastest, and most dangerous. The biggest advantage that you can give yourself is to upgrade your ammunition capacity as much as you can afford, as that allows you to rapidly shot without having to reload - and reloading is what tends to get you killed. When the target is a large boss dino you should use a big-bore rifle and scope. When the target is a bunch of smaller dinos you are best off using an Assault Rifle.